I managed to do a spot of shopping today. Bought two shampoos...which, for a shampoo ho, amounts to a whole hill of shampoo. 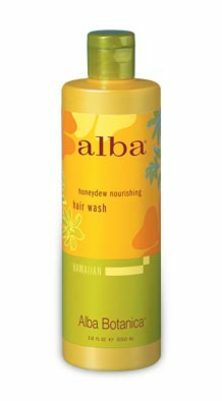 Both were repurchases, actually (again, highly unusual for said shampoo ho): Alba Hawaiian Hair Washes, Plumeria and Honeydew, one of each. They smell divine, with a strong, natural fragrance. They lather decently, pretty much like a regular "sulfate shampoo." They're not cheap (the way Queen Helene Mint Julep shampoo is), but they're still affordable; you don't need to use gobs o' shampoo at a pop. They clean well without stripping or doing that funny thing to colored hair. They leave hair soft and manageable. They're pretty good at not building up. All in all a pleasure to use. I can't wait to wash my hair tomorrow!